Since finishing my masters degree in May, I kind of put reading on hold. Grad school was so intense and I knew coming off the work load would mean I’d finally get to read some of my personal material, which I was really looking forward to! And then the day after grad school, along came Christian! And at work summer is our busiest time. So the reading thing… not so much. I won’t go through the list of books on my desk. The list by my night stand is shorter. No, it just came down to one book that was #1 on my priority list. 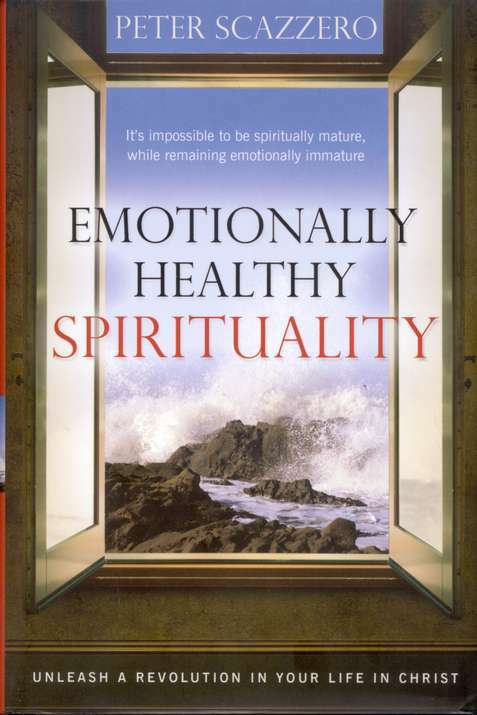 Emotional Healthy Spirituality (by Peter Scazzero) is our Robertson family book club book from last year. I’ll be honest – I kind of judged this book by its cover. I’ve read a few other emotional health books back when I was doing more college ministry leadership. I really enjoyed the material but at my current stage of life I didn’t think the book was really what I needed. But Katie started reading it and said that it was just what I needed to read. So I got after it. The point of this post is to share a glimpse of what I’m learning through this book and to offer it as a suggestion for your reading list if you think there might be something in it for you (my bet is there is). In a nutshell the premise of the book is this: through disciplined self-reflection and deep introspection, then and only than can we pursue mature spirituality. The two are inseparable and yet the emotional component is often ignored or under-appreciated in our culture. The book got really good for me in chapter six: Journey Through the Wall. The ancients called it the “dark night of the soul.” I know, sorry, kind of a downer. But in a pursuit of emotional health and a greater relationship with Christ, I’m willing to go there. Reading this book, you will too. The previous chapter talked about going backwards in order to move forwards. In looking backwards, this reflection leads us do a deep understanding of some of the subconscious aspects of our lives which leads us to the Wall. How do we know if we’re at the Wall? Our walk with God is no longer vibrant. The spiritual disciplines from our early years as Christians don’t work any more. Our relationship with God is slim to none. We may not enjoy going to church any more. “Starbucks and the New York Times are better companions on a Sunday morning.” And we don’t know where God is. For me this comes into play with my career. I am working a job where I feel I have come to the end. I have tools and relationships in place to switch careers, but the exit strategy isn’t working. Clearly there’s a lot more than I can share here, but this book has allowed me to search my subconscious and examine the Lord’s plan for my life. Statements like that can be cliche and trite. I assure you this process is anything but that. Emotional Healthy Spirituality has allowed me to dig into my relationship with God in new ways. It’s helped me realize the multiple layers of any given situation and has encouraged me to study each aspect of my life and know that God is in control. When you’re in the dark night of the soul, Scazzero argues that God is trying to purge something from your being, from your past, so that He can put something new into your life. This career path has been a struggle to say the least; maybe it’s been a trial; maybe it’s been a test; maybe it’s been hellish at times. Maybe it’s essential for what’s next. It was a response from what I’m learning in this book and how I’m applying it to my life, my family, my career. God knows how much I can handle. On days when I think it’s too much, I cling to this truth: God will not give me more than I can handle. Relying on His strength, I can overcome any situation. This book has given me the tools to look deep into situations, my past, and my daily attitude so that I can move towards emotional health and a greater sense of God’s provision. How about you? Have you looked at emotional health? Do you think you’ve experience the dark night of the soul? Might this book have something to offer you in your spiritual journey? I’d love to hear it in the comments. P.S. This book is part of Nancy’s Book Club, a Robertson Family book club sponsored by Paul and Jeri Robertson. They purchased this book for us and I want to thank them getting this into our hands. This entry was posted in book review, Christianity on August 17, 2013 by Hans Schiefelbein.